After all the times we’ve said B.A.P should take a break and get some much-needed rest, it seems like it might actually be, finally, happening. B.A.P has been working non-stop since debut: when they weren’t dropping new music in South Korea and promoting on music and variety shows, they were promoting in Japan and touring around the world. 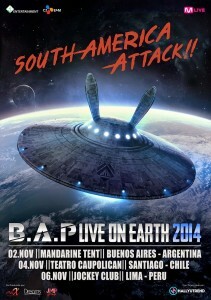 However, the group’s South American leg of its Live on Earth 2014 Continent Tour was cancelled in its entirety yesterday, with TS Entertainment following up on the matter in the following statement. Hello, this is TS Entertainment. First of all, we highly appreciate your kind support on B.A.P and would like to inform you of B.A.P’s schedule. B.A.P and TS have striven to fulfill our common goal so far; when viewing with a long-term perspective, we concluded that B.A.P deserves the sufficient time to get recharged in return for their relentless effort and endeavor and this is the time. So, we made the decision to suspend B.A.P’s official schedule after Music Bank In Mexico and for them to take a rest for a while, because the artist condition is the top priority for us. 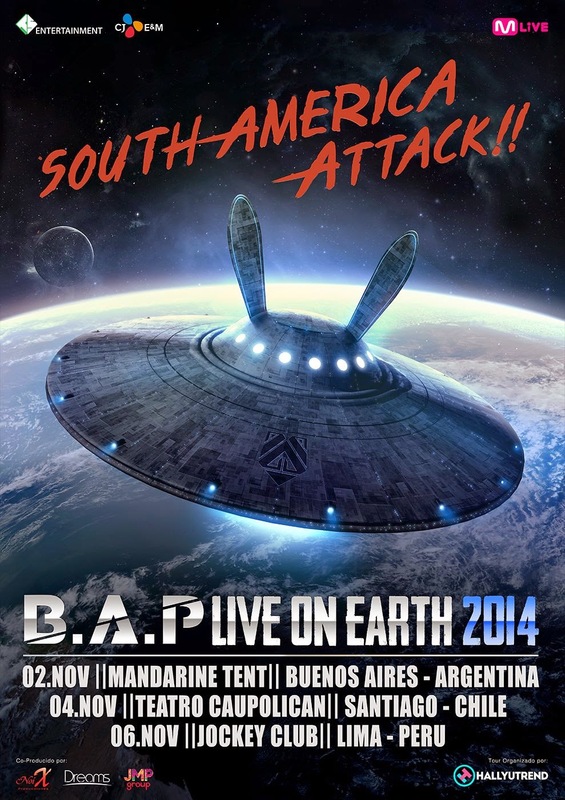 Therefore, we’re very sorry to inform you that we decided to cancel B.A.P Live On Earth 2014 South America Attack to be scheduled on November after talking with Hallyutrend in full faith who has been organized the tour. Even though we’re fully aware that lots of BABYs were waiting for B.A.P’s shows, we inevitably reached this conclusion so that B.A.P can show a better performance with a better condition in the near future; we look forward to your kind understanding. Again, please accept our sincere apologies on worrying you who really have been caring about B.A.P and we wish your continuous support and love until B.A.P is back. We promise that B.A.P will come back with the Best, Absolute, and Perfect stage/performance than ever within a short time. Thank you for your kind attention and see you soon. This is a disappointing turn of events for South American fans, but hopefully this hiatus will provide the members with the rest they need. What do you think about this sudden hiatus, readers?